CONGRATULATIONS TO THE VANCOUVER PIRATES 45+ FOR WINNING THEIR FIFTH CONSECUTIVE LMBA CHAMPIONSHIP IN A GAME PLAYED AT QUEEN'S PARK STADIUM ON SATURDAY, SEPTEMBER 29TH - IN ONE OF THE CLOSEST LMBA FINALS EVER, THE PIRATES CAME FROM BEHIND TWICE TO SCRATCH OUT A 9 - 8 VICTORY OVER A VERY TOUGH WHITE ROCK LEGENDS SQUAD. The Legends jumped out to a 4 – 0 lead in the first two innings highlighted by a 2 run double by Todd Nadon before Pirates’ Pierre Moore put the Pirates on the board with a solo home run in the bottom of the second. Kevin Gordon’s 2 run double in the bottom of the fifth pulled the Pirates within one run before the Legends added two runs in the top of the 7th to take a 6 – 3 lead. Pierre Moore drove in two runs in the bottom of the 7th before the Pirates exploded for 4 runs in the bottom of the 8th to take the lead for the first time by a 9 – 6 margin. Stuart Holloway’s 2 run, 2 out single brought in the go ahead runs. 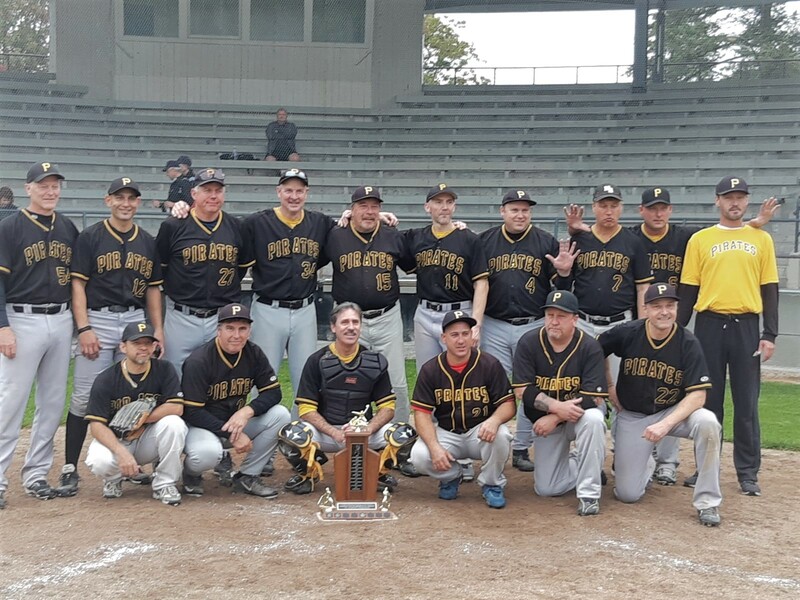 The Legends struck for two runs in the top of the ninth and left two runners on base as the Pirates hung on for their fifth straight 45+ championship win. Thanks to the umpire crew of Alana Page (home plate) and base umpires Gary Pakosh and Terry O’Krafka for a well officiated game.